Last week we looked at the name of actor Orpheus Pledger, who was in the Channel Nine telemovie, Schapelle. As it turned out, ratings for it were only average, with almost twice as many people tuning in to watch Channel Seven’s mini-series, INXS: Never Tears Us Apart. In fact, since the screening, an INXS album has reached #1 in the charts for the first time since 1990. Watching the mini-series reminded me of Michael Hutchence’s daughter Heavenly Hiraani Tiger Lily, who was given one of the “crazy celebrity baby names” of the 1990s. It’s interesting how much less “crazy” crazy celebrity baby names seem as the years go by: once Cruz, Maddox, River, Rocco, Banjo, Jett, Sunday and Coco were considered outrageous, but now they’re mainstream. I have to admit that the Heavenly Hiraani part still seems offbeat 17 years later, but Tiger Lily is pretty rocking – a spunky nature name combining flora and fauna. 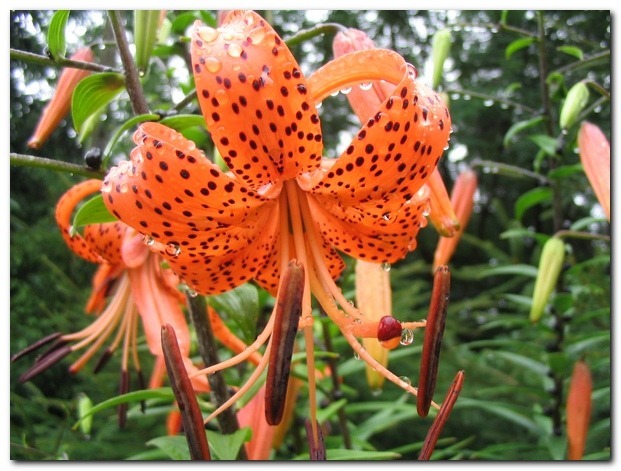 The Tiger Lily (Lilium lancifolium) is native to China, Korea and Japan, and its common name came about because its flowers are large and bright orange with black markings – although they don’t literally have tigerish stripes, but spots. Introduced to England in the early 19th century, it became naturalised in some parts of the United States (just to confuse things, Americans refer to some native lilies as “Tiger Lilies”). Easy to grow, the Tiger Lily is edible, and the roots used in Chinese cooking. There is a legend that a Korean hermit took an arrow from the foot of a wounded tiger, and after its death, the tiger transformed into the Tiger Lily, so that he could remain with his human friend. When the hermit died, the flower spread widely, searching for the hermit. The Tiger Lily is said to symbolise wealth, perhaps because its spots reminded people of coins. A funny superstition related to these spots is that if you smell a Tiger Lily, you will end up with freckles! There is a graceful tiger-lily in Lewis Carroll’s Through the Looking Glass, a passionate and rather bossy bloom which tries to keep all the flowers in line (with the ferocity of a tiger). When Alice wishes to herself that the flowers could talk, the tiger-lily is the first to respond, with “We can talk, when there’s anybody worth talking to”. The first human character in fiction named Tiger Lily I can think of is the “redskin princess” of the Piccaninny tribe in J.M. Barrie’s Peter Pan. Beautiful and brave, Tiger Lily’s life was saved by Peter Pan, so that her tribe became his allies. As a result, the flirtatious yet aloof Tiger Lily harbours (futile) romantic feelings for Peter, and refuses to marry. Barrie gives her cringe-inducing dialogue, such as “Me Tiger Lily. Peter Pan save me, me his velly nice friend”, and her tribe call Peter The Great White Father – Barrie’s preference for the book’s title, which his publishers’ fortunately didn’t think was a good idea. In the 1953 Disney film of Peter Pan, this dialogue is embarrassing enough that Tiger Lily doesn’t speak at all, and her role was eliminated in later films, lest the stereotypes of Native Americans should give offence. Because of this, she has never become a Disney princess (in fact, calling her a “princess” would be a whole other cultural controversy). Another exotic Tiger Lily from children’s fiction is a little girl of Chinese heritage in the Rupert Bear comic strips and television show. A rather mysterious figure of royal blood, her father is a Conjurer, and she has quite a bit of magical knowledge herself, which helps Rupert in several adventures. Not nearly as controversial as Barrie’s Tiger Lily, her role was nonetheless phased out in the 1990s, presumably for similar reasons. In Australia, Tigerlily is a swimwear fashion label started by designer Jodhi Meares, which gives the name an expensively casual, beachy feel. If you look at the models used by Tigerlily, and at its Facebook page, the ideal “Tigerlily girl” is not some blonde beach bunny with a banging bod, but sophisticated and well-travelled, yet relaxed and confident enough to be in search of the perfect bikini. Tigerlily is a rare name, but there is something rather magnificent about it. We usually think of lilies as pale and demure, yet here are these flamboyant tiger-cat lilies – big, bright, and bold, growing wild and untamed, or bringing a garden to life with glorious colour. Tigerlily sounds gorgeous and fierce, exotic and feminine, freckled and free-spirited, full of passion and vivacity. It could be seen as whimsical and hippie, but because of the expensive fashion label, also seems quite posh. Worried that Tigerlily is too big a name for a little girl? Miss Hutchence Geldof goes by Tiger, but you could also use Ty, Tige, Tig, Tiggy, Tilly, Iggy, Lily, Lil, and TL. Tigerlily received an approval rating of 56%. People saw it as a beautiful, whimsical nature name (26%), and wild and bold (19%). However, 13% believed it was still a wacky celebrity baby name, and 12% saw it as too hippy-dippy. I think the name Lily by itself is played out, so TigerLily (or whatever the spelling) is a way to make this name fresh again. Definitely! I think a great choice for someone who loves Lily, but wants something less common.